Commissioned by Real Art Ways, Dark Segment is an exhibition of works created during a yearlong investigation by interdisciplinary artist Hong Hong, supported by the Edward C. & Ann T. Roberts Foundation’s Creation of New Works Initiative. Continuing an ongoing exploration of large-scale papermaking, the exhibit comprises compositions created using whole and torn sheets of handmade papers. Rooted in her research of the temporal parameters of human perception, and its effects on social, cultural, and environmental systems, the exhibition changes over time. 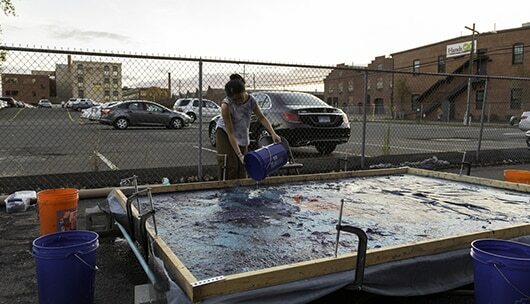 Hong will utilize natural means of change (bringing the paper outside so the sun bleaches the color away) as well as human intervention (the artist rearranging her compositions on walls.) The result is a gallery that evolves and changes over time, referencing how time affects perception, memory, and social connections. Born in Hefei, China, Hong Hong is an interdisciplinary artist whose practice spans papermaking, sculpture, installation and performance. Hong earned her MFA in 2014 from the University of Georgia and her BFA in 2011 from the State University of New York at Potsdam. Her work has been exhibited across the United States in shows at the Newhouse Center for Contemporary Art, Pittsburgh Center for the Arts, Madison Museum of Fine Art, New Mexico History Museum and Georgia Museum of Art. She currently works and lives in Connecticut. For more information on Hong and her work, click here to visit her website. 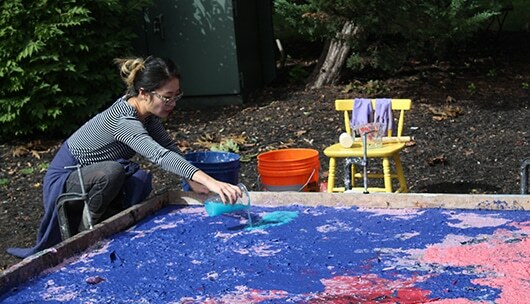 Read “Making Paper: Hong Hong’s Performative Process” at Connecticut Art Review. "Hong Hong is committed to the thorough consideration of material and meaning. Real Art Ways is pleased to commission this new work, and grateful that we have such a talented and dedicated artist in our community." As part of her process exploring the effects of time on our perception, Hong Hong will periodically install new compositions for Dark Segment. The exhibition has been updated with new compositions as of January 21, 2019.